22 gr. of 2400 have always given me sticky extraction, or at least somewhat difficult extraction in all of the Rugers that I've fired them from, both SA and DA. 21 gr. does well. I dunno what difference one grain makes, but that has been my experience. It didn't damage anything, and I still have years old brass that shoots just fine, but that one grain made it easier to get my brass out. all that's being said is some guns shoot faster than others.no surprise .that's why you tailor loads to each gun. Today's 22grs. 2400 is too heavy for a Smiff and Wesson, I only use 21 grs. in my Ruger or Freedom Arms, when I play with near max. loads in the .44 I much prefer using H110, it keeps me out of trouble. That's been my experience too in a 3 S&W's and a Ruger Flat Top. But a lot of variables affect extraction: for a Smith, the extraction of 6 casings is naturally going to be more difficult than the single extraction from a Ruger SA. That said, the Smith's cylinder holes are polished to a much higher standard than the Ruger mitigating the problem somewhat. All in all, I find that 20-21 grains of 2400, new or old, does better for me, considering both accuracy and extraction issues. Larry Gibson, have you found 296 gives better accuracy than 2400 when assembling loads with one of the Keith look-alike LSWC's in the .44 Magnum? It's a broad question, I know, but...considering Smith's and Rugers, what's your take? I've shot a lot of S&W M29s, Ruger BHs, a few Ruger RHs, several SAA clone 44 Magnums, 3 Contenders and several M92 and M94 rifles and carbines over the years with both 2400 (Hercules and Alliant) and 296/H110 under the Lyman 429421 and the RCBS 44-250-K. Frankly the accuracy is a tossup between them in handguns but 2400 gets the nod in the carbines and in some rifles. The reason being the Keith load (22 gr 2400) still keeps the velocity under 1600 fps which seems to be the point of no return accuracy wise for PB'd cast. With top end 296/H110 loads the velocity is too much for the PB'd bullets. I use 296 and H110 top end loads with GC'd bullets, especially when used in barrels longer than 18". I also prefer the GC'd bullets cast soft over 296/H110 for top end loads with my 270 - 275 gr HP bullets. Here is the test result from my test of Hercules vs Alliant 2400. The full thread is about half way down the 1st page of the Classics & Stickies sub forum. Sometime back I stated I would conduct a pressure test comparing the old Hercules 2400 with the newer Alliant 2400. Alliant, since taking over manufacture of the Hercules powders, says they have not changed the formula of 2400 yet most reloading manuals show a decline of around 1 gr with maximum loads. The question of whether or not there is a difference between old Hercules 2400 and Alliant 2400 most often comes up with the .44 magnum, specifically with 429421 and the classic “Keith” load of 22 gr under that bullet. Lyman’s Cast Bullet Manual lists a maximum load at 23.4 gr of 2400 with the 429421 cast bullet, their “Keith” bullet. Some say 21 grains is the max with the newer Alliant 2400 and others still shoot 22 gr of the newer Alliant 2400 the same as they did with Hercules 2400. This begs the question; is there a difference between the older Hercules 2400 and the newer Alliant 2400? This test will focus on the pressure difference between the two powders if any. Though I will mention accuracy in a couple places let us remember we are concerned about pressure here and what is a “safe” load, not what is an accurate load. As an after thought I also decided to throw in a test string using magnum large pistol primers to test whether there is an internal ballistic difference between their use and the normal use of a standard large pistol primer in the 44 magnum with the classic “Keith” load. I have conducted this because I have the equipment not only to measure the velocity but also the psi of many cartridges, the 44 magnum included. I also decided to include a test of a popular load using 2400 with a 160 grain cast bullet in the 30-30. I conducted the test yesterday, the 7th of January 2010. The test was conducted at Tacoma Rifle and Revolver Club on the main range. There are very solid cement benches there and I use the same bench when conducting pressure tests with the screens, equipment set up in the same position and locations. The test instrument is the M43 Personal Ballistics Laboratory made by Oehler Research. The test firearm was the Thompson Center Contender; a 8.4” barrel for the .44 magnum and a 21” barrel for the 30-30. The 44 magnum barrel has a 1.5X Bushnell scope mounted on it and the 30-30 barrel has a Weaver K4. The 30-30 barrel is in carbine form with a Brown thumbhole rear stock. It took a while to locate an old can of Hercules 2400 but a forum member, Shuz, came across with one. He lives in Spokane so it took some coordination to get it transported to me on the other side of the state. Many thanks should be given to Shuz and his daughter who made this test possible. The cardboard cylindrical “can” of Hercules 2400 was unopened and I cut the plastic end off the little plastic spout. The bottom of the can was marked “Shift 1”, 02400 066, 12693. The plastic “can” of Alliant 2400 has a lot # of CE0519 on it and was purchased last year before the rush. The 44 magnum bullets were cast of WWs+2% tin in a RCBS 44-250-K double cavity mould. Bullets were inspected for complete fill out and other defects but other than that were non selected. The bullets fully dressed weighed 254 grains. The bullet lube used was Javelina and bullets were sized .430 in a Lyman 450. Cases were new, unfired, Winchester WW Super manufacture. Primers were Federal 150s and CCI 350s. Cases were sized and loaded in RCBS dies. A heavy roll crimp was applied in the bullets crimp groove as a separate step. AOL was 1.705”. Powder charges were weighed on a Redding scale. 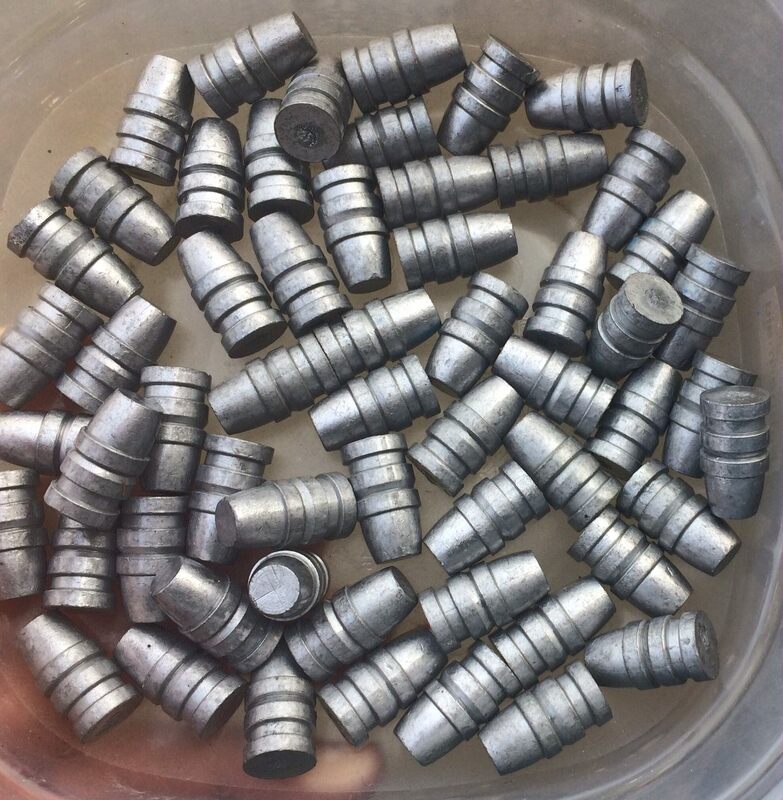 The 30-30 bullets were cast of the same alloy in a Lyman 311466 double cavity mould. The bullets were visually inspected only for defects. The Hornady gas checks were pre seated then the bullets were sized and lubed with Javelina in a Lyman 450 with a .314 H die. The bullets were then pushed through a Lee .311 sizer. The fully dressed bullets weighed right at 160 gr. The .311 sized bullets when loaded in the FC 30-30 cases gave a very tight slip fit in the chambers neck. Cases were full length sized in an RCBS X-die die with a Lyman .31 M-die used to expand the case mouth and a 7mm seating die used to seat the over diameter bullets. Primers were Winchester WLRs. The bullets were seated with the front diving band just off the lands putting the GC right at the base of the case neck. AOL was 2.45”. Test; the test strings for the 44 magnum consisted of 10 shots each for 20.5, 21, 21.5 and 22 gr of both Hercules and Alliant 2400. At 21 gr I also fired the additional test string of 10 shots using the CCI LP magnum primer. The target for the 44 magnum was at 50 yards. The start screen was 16 feet from the muzzle. 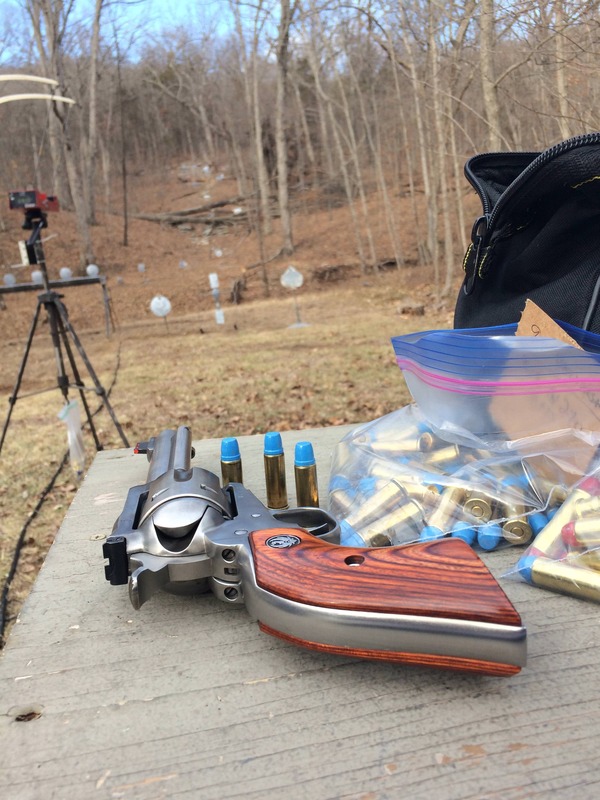 The 30-30 test strings were also of 10 shots each and consisted of 16 gr of each of the 2400s. The target for the 30-30 test was at 100 yards. The start screen for the 30-30 test was 15 feet from the muzzle. The temperature during the test range from 39 to 43 F. There was no wind to speak of. As is my usual practice when I set up the M43 I fired a 5 shot test string with a specific .308W rifle and one lot of M118SB as “reference ammunition” to ensure the M43 set up is good. This same specific rifle is used with a clean bore and the same lot of very uniform ammunition each time I set up the M43 for a test. In this case the reference ammunition test velocity and psi data readings were well with in norm for the 39 F temperature. All was good with the M43 set up so I conducted the test. At the conclusion of the 44 magnum test I cleaned the barrel and also ran 2 jacketed loads through it as a reference. This was a factory load and another standard load with a jacketed bullet. The ballistic information on these is also included for reference. Added: With regards to the seemingly low psi; this test was conducted at 39 -43 F. A check of previous test with this same bullets and same lot of 22 gr of Alliant conducted when the temperature was in the high 70s revealed an increase of 5,000 psi over what was obtained in this test. Obviously the ambiant temperature is a variable that must be considered. Data and remarks; I will list the data for each charge as; H2400 (Hercules 2400) or A2400 (Alliant 2400) /velocity (adjusted to muzzle)/SD (Standard Deviation)/ ES (Extreme Spread) and under that will be the MAP (Mean Average Pressure)/SD/ES. All velocities, SDs and ES are in feet per second. All MAPs, SD and ES are in psi(M43). Keep in mind that pressure data and velocity data are not absolutes. There are expected variations between test strings of the same lot of ammunition and also between lots of components, especially powders. Alliant, of course, does not reveal the variation between lots of any powder. I do know that it was acceptable for a +/- 5% variation (10% variation possible) between different lots of IMR 4895. This is why some lots shoot ‘faster” or “slower” than other lots of the same powder. Also keep in mind that factory published psi and SAAMI psi are maximum allowable average pressures for specific cartridges. That does not mean every one of those cartridges are loaded to that psi level. Quite the contrary most factory and arsenal ammunition are well below those published figures, a “fudge factor” if you will. The 44 magnum cartridge has a SAAMI MAP psi, using piezo-electric measurement, of 41,000 psi or 36,000 C.U.P. (Copper Unit Pressure). Also keep in mind that I am not using a SAAMI spec test barrel. I am using a production barrel with more than likely specs that are not at minimum like the SAAMI specs. Thus we can expect somewhat less velocity and attendant less pressure out of the Contender barrel than we would get with identical loads out of a SAAMI spec test barrel. For that very reason I would not load to the SAAMI max of 41,000 psi in this barrel. In my experience with the M43 and psi measurements in production barrels I would consider 35,000 psi(M43) to be a maximum load for the 44 magnum in a production barrel such as the Contender’s. From the above data, with the exception of the 21 gr data, we see that the Alliant 2400 appears to be “hotter”. However, the difference is less than 2% which is probably well within acceptable lot to lot variation. The 21 gr load where the Hercules 2400 is “hotter” is even less that 2% variation. Note that the 21.5 gr load of Hercules 2400 has 2,400 less psi than the 21 gr load of Alliant 2400 but still has a slightly higher velocity….such are the variances and why there is an acceptable variance. It is also why the “fudge factor” is built in. Were all the loads of Alliant 2400 “hotter” than the Hercules 2400 we could safely say, at least from this test, that this lot of Alliant 2400 is “hotter” than this lot of Hercules 2400. However that is not the case. With this test it appears both powders fall within lot to variation of a specific powder. The Magtech factory ammunition is fairly indicative of current factory velocities and pressures. The Hornady XTP load is a popular load for that bullet and you can see the velocity and psi is up there. Lyman lists 23.4 gr of 2400 as a max load with their 429421 in the 3rd edition of their Cast Bullet Handbook. I can not disagree with that psi wise given the results of this test. As to accuracy I have found with PB’d cast bullets used loaded in revolver cartridges and shot in other Contenders, revolvers with 6”+ barrels and rifles that accuracy starts to go above 1400 – 1450 fps and so it was with this test. The 21.5 gr load of both Hercules and Alliant 2400 with the CCI magnum primers proved to be the most accurate load on target even though the standard Federal primer load had slightly better internal ballistics. A repeat of the test could very well reverse that as the difference between the two powders internally or accuracy wise wasn’t enough to consider remarkable. I would use either load in this Contender barrel for hunting. Remarks; 2400 is reputed to be a fine powder for midrange cast bullet loads with a filler not being necessary. It also is supposed to be non-position sensitive. I will agree with that to the extent if heavy for caliber cast bullets are used such as 190 – 220 gr bullets. My experience of years ago with medium weight bullets was born out again by this test, 2400 is not an efficient powder for medium or light weight bullets and with such is, indeed, position sensitive. The first 3 shots were foulers and no effort was made to position the powder in the case. The ES was from 1688 fps to 1822 fps. That was unacceptable. I thus conducted the Hercules 2400 test by raising the muzzle about 45 -60 degrees before shooting to position the powder to the rear of the case. Even then ignition was not what I would call consistent with the Hercules. With the Alliant I raised the muzzle to 90 degrees before shooting and the ES of the psi improved dramatically. There were also pressure spikes both up and down when the bullet was about 2/3s down the barrel. The pressure spikes were not any where near the MAP pressures but it showed uneven ignition and burn of the powder. Note also that the Alliant 2400 gave a lower MAP than the Hercules 2400 even though the velocity was slightly higher. Even with the large psi ES of the Hercules 2400 the average pressure of the 2 powders is so close that they again, in the 30-30, fall well within lot to lot variation of a specific powder. Conclusion; Alliant says they didn’t change the formula for 2400 and you can’t prove by me otherwise. With cast bullets I shall to use 22 gr of Alliant 2400 under the 250 gr "Keith" style cast bullet in the 44 magnum as that load shoots very nicely in my Ruger 50th Anniversary BHFT at 1350 fps. Caveat; I did not conduct any test with Alliant 2400 and jacketed bullets of 240 grain weight and the results of my test are not to be inclusive of them. It is expected that the pressures would be higher but since I have not ran a test all I can say is stick with current published data when using jacketed bullets and either Hercules 2400 or Alliant 2400. I am just glad there isnt any difference in 2400 over the past 62 years since Keith worked his Keith Load. I would say the lots have stayed very, very close to the same. Probably the same is true with primers and bullets. Back in Keith's day the conventional wisdom was that Hercules #2400 needed "magnum" primers. More recent Speer Manuals #13 and later indicate that "magnum" primers are neither required, nor recommended with current Alliant #2400. In my experience primers matter. A load which is a good full-charge load with Remington 2-1/2s acts "hotter" when using Winchester WLP or Federal 155s. 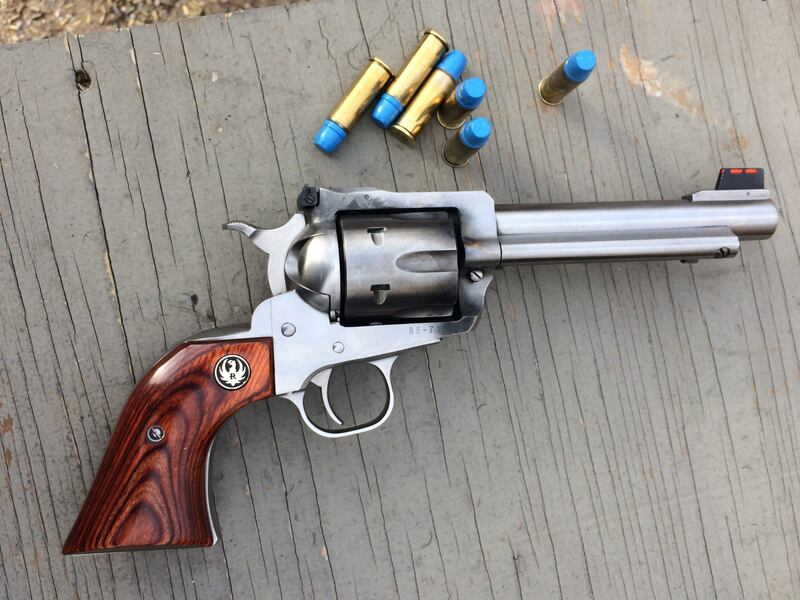 Full disclosure, I don't shoot full magnum loads in my .44 Magnum revolvers anymore, but reserve them for rifle use. Since I had wrist surgery ten years ago my surgeon who is also a gun nut advised me in plain language to back off off if I didn't want my wrist operated on again. He said that there were no guarantees if I got stupid and repeated the injury. Therefore my normal "Go-To" loads in both .44-40 and .44 Magnum are 7.2 grains of Bullseye with Accurage 43-230G cast 1:30 tin-lead. The deer cannot tell the difference. I have used 21.5gr before in my S&W 629, and to say it's a hot load is an understatement. Still, I don't recall any kind of sticky extraction issue. My go to hot load is 20.5gr. I haven't had any issues with that either. My "light" load is 9.0gr of Bullseye, which is pretty pleasant to shoot. I use the Lee 240gr plain base SWC for both of these loads. It drops a little closer to 245gr - 250gr IIRC. This thread just keeps getting better and better. Here are some of my data. I do not claim that 18.0 gr of 2400 is anywhere close to maximum, just that I had good results with it in a 7-1/2" Ruger SRH. These are each the average velocity of five shots. Accuracy with all of these loads was better than one inch at 25 yards using a 4x Leupold scope and sandbags. These data were collected in November of 2015. All loads used 18.0 gr Alliant 2400. Although these loads are all well below maximum, the outstanding accuracy of all of them makes them quite satisfactory to me. I'd just like to add to Outpost and others observations about magnum vs standard primers, different chambers, etc., that new versus resized brass can make for extraction differences, as well as factory differences in thin vs fat, soft versus hard brass. My understanding is Keith originally developed the 2400 load with standard primers in 44 Special, then continued in 44 Mag with standard primers, at least for a while. If that is the case, it would be no surprise if a later gun writer with different brass, magnum primers, and a tight revolver might get sticky extraction. Throw in lot to lot variation as Larry mentioned and SOMEONE is going to get sticky extraction (and "confirm" that 2400 has changed). But all it really means is that it is a hot load that one should work up to incrementally, for all the usual reasons.